From its creation in 1939 as one of the first four “sister” buildings on the University of Oregon Memorial Quad, Chapman Hall has been a historic landmark on campus. Throughout the years, Chapman has housed the bookstore, the home economics department, communications offices, the graduate school, and most recently, the Clark Honors College. 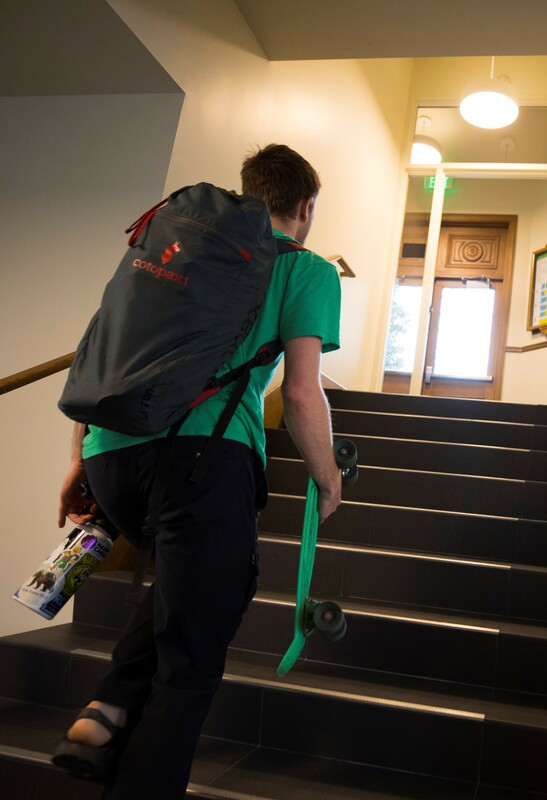 As Chapman Hall became the heart of the honors college, the community found themselves working around the unique quirks of the building, like the lack of an interior stairwell connecting the first and second floors. While the eclectic nature of Chapman added to its personality, the disjointed physical space was not serving the needs of the honors college community. At almost 80 years old the building’s features were outdated, like the narrow doorways that did not meet accessibility requirements, and the lack of electrical outlets keeping students from charging the devices they used for their schoolwork. Starting in 2009, the honors college began petitioning for internal renovation funding through the Oregon University System capital projects program, a process in which proposed construction projects at all of Oregon’s public universities competed for limited state funding. Students, faculty, and alumni lobbied for the project’s approval through letters and testimonials, arguing that over 20 percent of the building’s systems needed repair or full replacement. 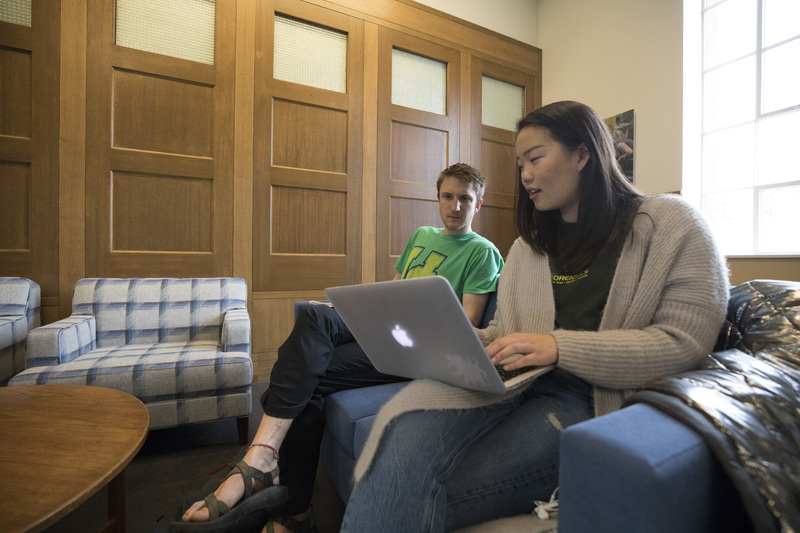 Community members reached out to legislators in an effort to help them see the honors college not just as a school, but as a vital space for Oregon’s high-achieving students to find their passions and learn the skills they need to achieve them. It was an uphill battle. The first two applications to the capital projects program were narrowly turned down in favor of other needs and proposals, but the third time was the charm, and in July of 2015 the Chapman Hall renovation was green-lighted. The project needed $8 million in state bond funding, $2.5 million of which required a match from the college, for a project total of $10.5 million. With focus and determination the college community began raising the money needed for the match through private donations, and many alumni responded to the call, giving generously in support of the college and its mission. Passive Ventilation: Chapman Hall has one hundred steel frame windows, all original to the building, and all in very good shape. Each remodeled space has at least one operable window, enabling greater control of the temperature in these spaces, and reducing the need to artificially cool the building. Chilled Beams: We all know that warm air rises, and that cool air falls. The renovation takes advantage of this fact by putting chilled beams in the ceilings, so that the cooled air will cascade down over professors and students on warm days. Reused and Repurposed Materials: Many materials original to the building were in usable condition, with a little refinishing. The design team worked to include these reused materials in unique ways, preserving some of Chapman’s storied history. Wooden cabinets and displaycases were preserved, as were many of the original wood doors. Because the narrow 1939 doors do not conform to today’s accessibility standards they could not be used for their original purpose, and instead are now displayed as a unique wall treatment and backdrop to the third floor Student Lounge. Green chalkboards original to the building were also salvaged, and put to use in the student spaces on the second floor. 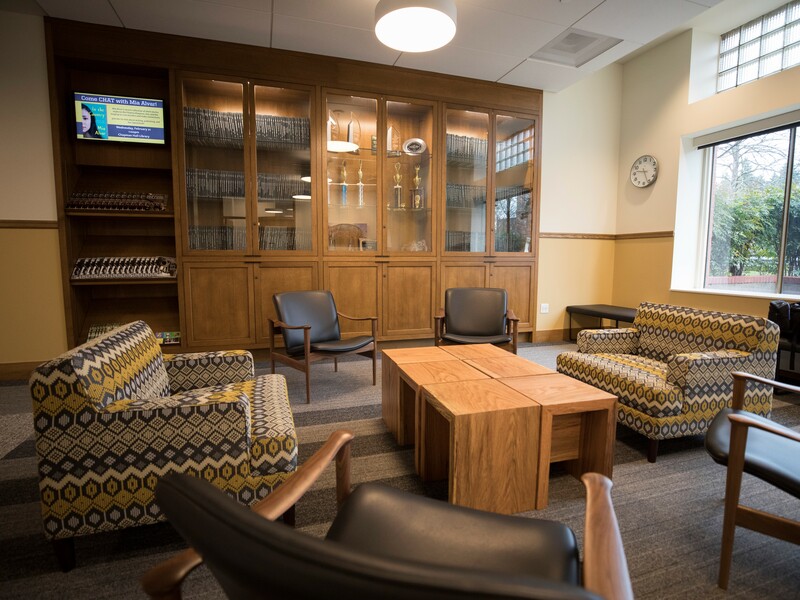 Reclaimed Lumber: The building Hearth and Library feature several pieces of furniture constructed from reclaimed lumber, salvaged from two large pin oak trees that had to be removed from another area of campus. Six stools, a long bench, a tea bar for refreshments, and two large study tables made from these trees were incorporated into the Chapman design. Milling, curing, and fabrication of the furniture was done by a local company specializing in reclaimed lumber. The reclaimed pin oak furniture complements the Forest Stewardship Council (FSC) certified rift cut red oak used throughout the building. 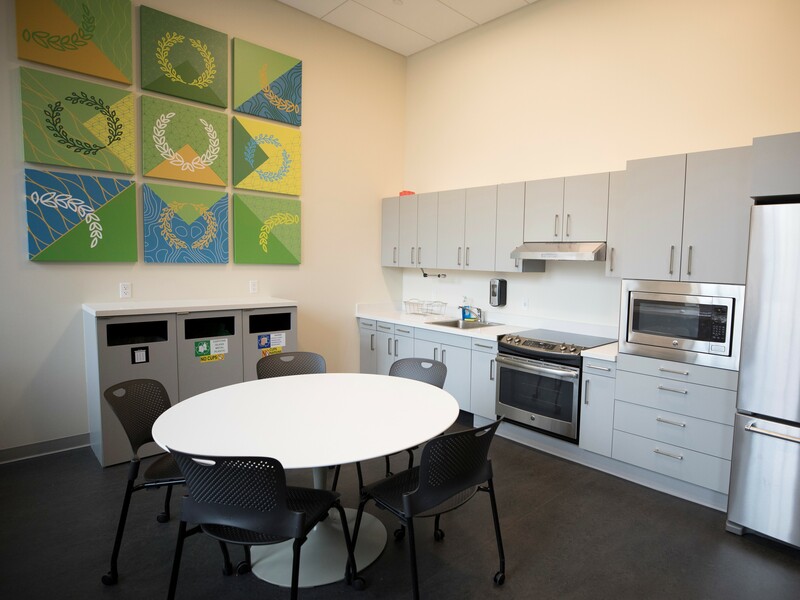 Zero Waste: Chapman Hall participates in the University of Oregon’s Zero Waste Program, operating in a manner that aims to protect the environment and public health, conserve natural resources, and minimize waste going to the landfill. Each floor of the building features Zero Waste Stations, encouraging recycling. Borrowed Light: Transom windows and fluted glass sidelites accompany nearly every interior door, a design technique that allows light from exterior windows to filter into interior spaces. This works particularly well in Chapman, a rather long and narrow building. Using borrowed light to daylight hallways and common spaces has eliminated the need for 24/7 active lighting of the building – a big energy saver. Historic Preservation and Restoration: Chapman Hall included several elements of Primary Historical Significance. 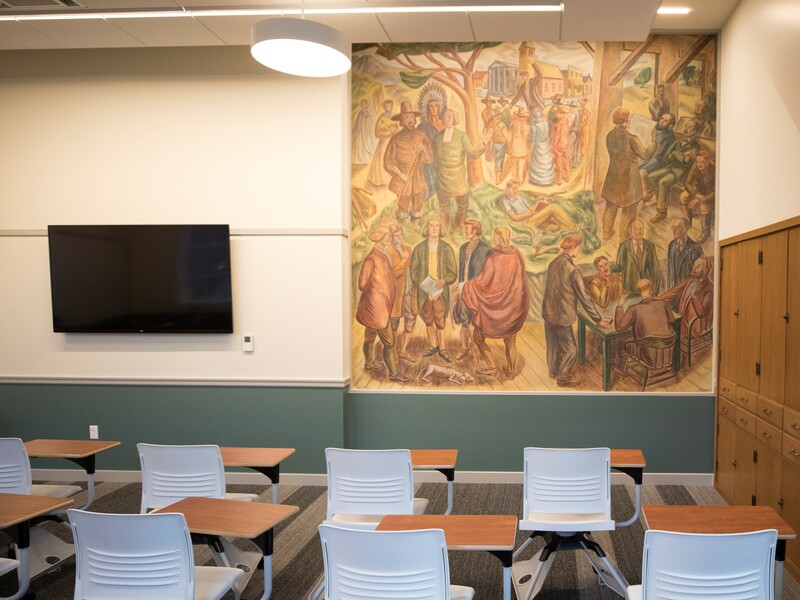 The mural created by Earl R. Scott in 1942 as a Master of Fine Arts thesis project, “The Tradition of American Philosophy,” can now be found in a second floor classroom, and was protected in place during the renovation; as was the original third floor fireplace framed in knotty pine. Over time the building’s main entrance off 13th Avenue was altered. The renovation restored the entrance to its original design, complete with double doors and recessed into the building. Matching the existing terra cotta elements was achieved with stained glass-fiber reinforced concrete blocks. The west stair leading up to the second floor landing from the Memorial Quad was also refurbished, and exterior brick around the entire building was cleaned and repaired. Seismic improvements were made, to ensure the building keeps safely standing during an earthquake. 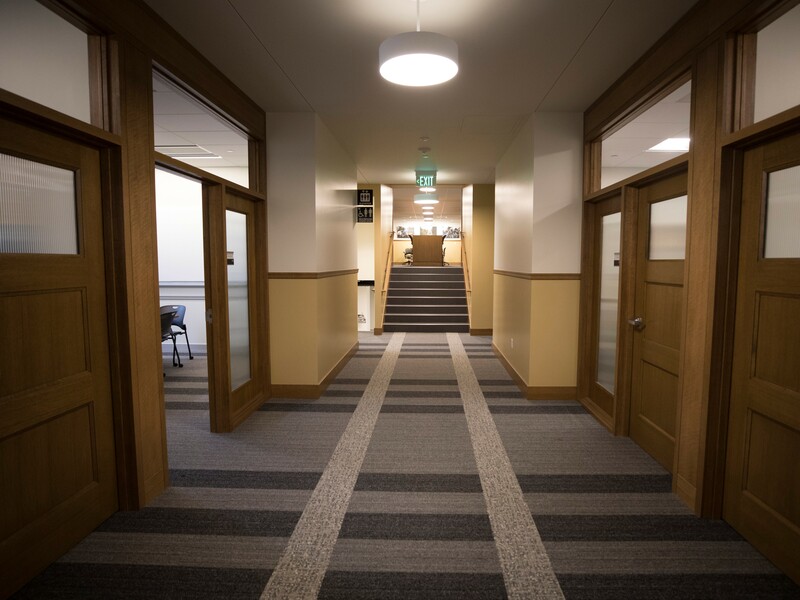 The building renovation, as well as temporary relocation of CHC faculty and staff to other campus buildings, was guided by Gene Mowery, UO Owner’s Representative, and Renée Dorjahn ’82, Director of Finance and Administration and an honors college alumna. Prior to the approval of bond funding in 2015, Dorjahn coordinated the initial programming study, seeking feedback from students, faculty and staff on their visions for the renovation through a series of workshops. Students were asked about other recently renovated buildings like the School of Journalism and Communication’s building Allen Hall, and the Lillis Business Center — buildings that are full of glass walls and mixed metals. While students admired these modern buildings, it’s not what they wanted for Chapman Hall. Danae Burck and Zach Sherrod agree that for many honors college students Chapman is a home away from home. Clark Honors College and architecture students, Burck and Sherrod sat on the Chapman Hall Renovation User Group. A uniquely inclusive design team, the User Group comprised not only honors college faculty, staff, students, and alumni, but also representatives from the university’s Registrar and Campus Design and Construction offices, the design team from Hennebery Eddy Architects, and general contractor Fortis Construction. Burck says the team wanted to make sure they conducted the renovation in a manner that would maximize the functionality for the building’s main occupants – students. Prior to the renovation “A lot of the spaces didn’t really work for the types of interactions between students and professors, which the honors college prides itself on,” she said. One of those needs was to design classrooms that could serve both the intimate style of honors college classes and larger groups. 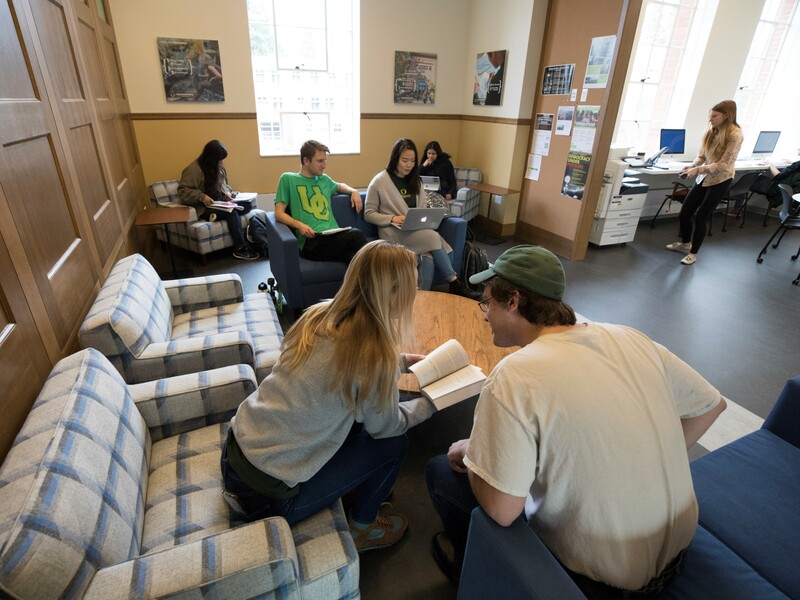 While the honors college has priority to schedule classes in the building each term, any unused time slots are then filled with other classes. 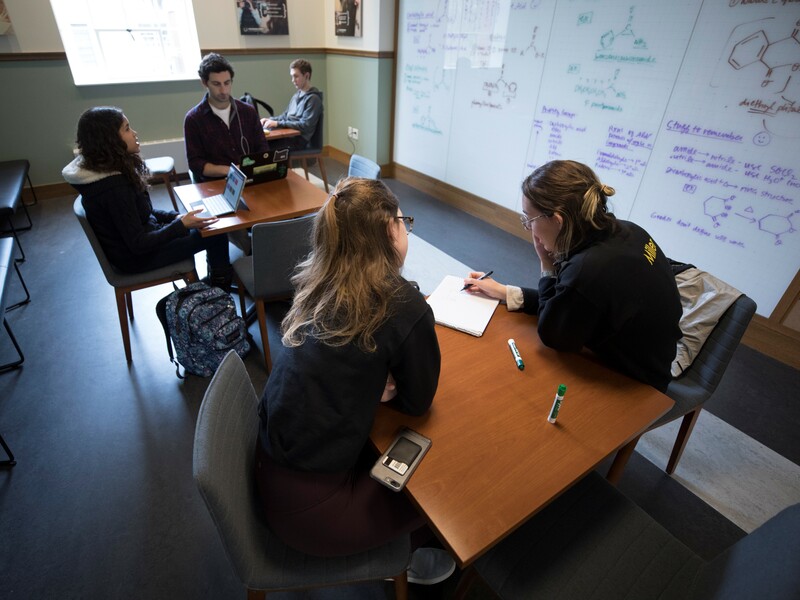 “The rooms accommodate small interactive learning methods adopted by CHC faculty and students, and are also large enough to accommodate a broader use of the space,” said Associate University Registrar Brian Lowery. When a building is located in the heart of campus, classrooms can’t be allowed to sit idle. The give-and-take on classroom space has worked out well for everyone. The Registrar’s Office schedules classes into the lecture hall during the day, and the honors college has use of the space for events after hours, including guest lectures and movie screenings. 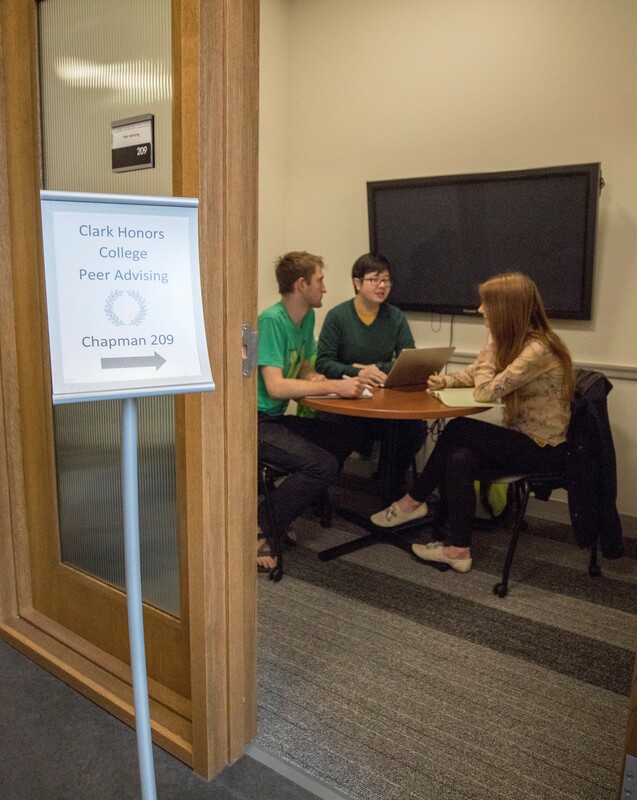 The majority of honors college classes can now be held in Chapman Hall, a foundational goal of the project that aims to increase the overall sense of community by ensuring that both students and faculty regularly spend time in the building. Right-Sized Classrooms: Honors college classes are capped at 19 students, but the average class size is only 15, and classrooms designed for larger groups felt awkward prior to the renovation. Now, two seminar classrooms on the first floor are the perfect size for honors college classes. Second and third floor classrooms, which can be used by the university for non-honors classes when needed, have solved the design problem through creative furnishing. Tablet armchairs on wheels make it a quick and easy process to arrange the room to the desired configuration at the start of each class. 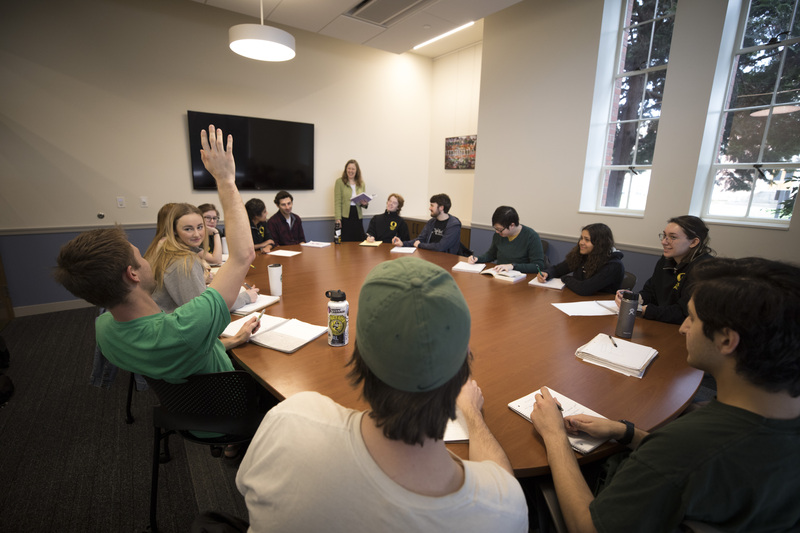 The new classrooms enable the honors college to bring classes back to the building, with over three-quarters of honors college classes held in Chapman during spring term 2018. Connectedness: Prior to the renovation, moving between the first and second floors of the building meant a quick dash outside, often through the rain. The lack of an interior staircase made the building feel disjointed, and challenging to navigate. With the new interior stair in place, the building just feels right. This final touch brings the building together as a cohesive whole. Community and Collaboration: Both classrooms and common spaces are found on every floor of the building, and the common spaces especially are essential for giving the building that ‘lived in’ quality. Whereas prior to the renovation students could be found sitting on the floor and in the stairwell while waiting for their class, now comfortable spaces for individuals and groups welcome them in. 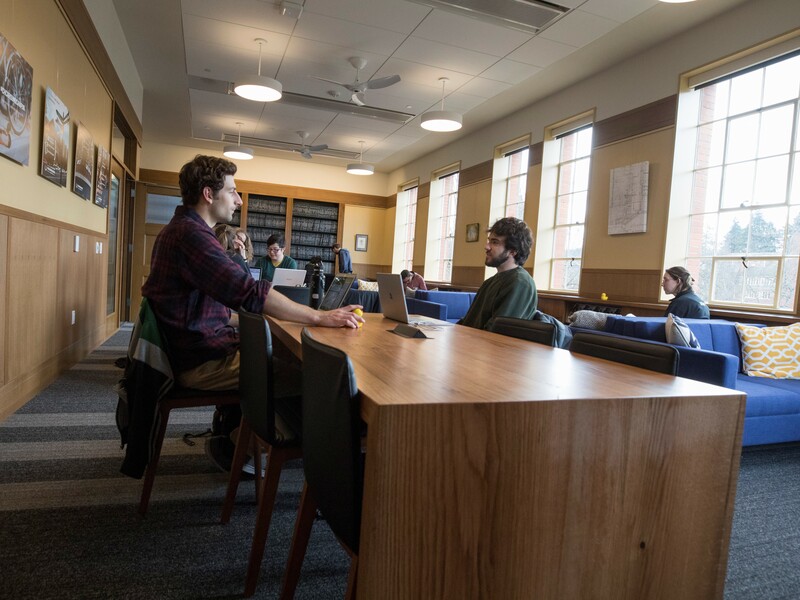 The building’s third floor features not only the thesis library, student lounge, and kitchenette, but also a new faculty commons – a space specifically designed for faculty and students to meet and mingle. Other “wants” on the list had to find creative compromises as well. When considering how students use the building today, technology must be front and center. Because most students now have their own laptops, there isn’t a need for a dedicated computer lab – a key feature in pre-renovation Chapman. Instead, common spaces that allow students to charge their computers and work in groups became a higher priority. The project focused on function, sustainability, honoring the building’s historic status, and creating a physical space that supports the interactions of the honors college community — goals that have been met with flying colors. It was clear that the building needed to serve as both the face of the prestigious Clark Honors College and a home for the community it serves. On the third floor, students can make themselves a grilled cheese and a cup of tea in the kitchenette before meeting with their thesis advisor, while on the ground floor alumni, visitors, and prospective families are greeted by the Hearth, accented by wood and leather, harkening to the long-standing tradition of academic excellence. 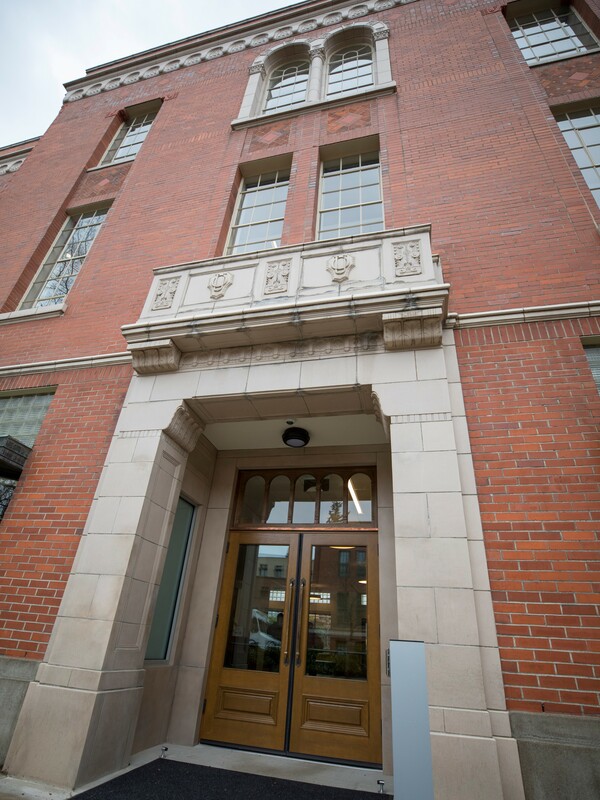 The new Chapman is on track to achieve LEED Gold status – a unique and impressive accomplishment for a historic interior renovation, as well as energy efficiency 35% better than the current State of Oregon requirement for new buildings. Chapman now embodies the technological, education, and communal resources the honors college needs to match the ambitions of its students for years to come. Dan Cohen ’84 is an active alumnus within the Clark Honors College community. He sits on the college’s Advisory Council, a group of alumni and college supporters that look for ways to continuously improve the role of honors education at the University of Oregon. “In recent years, I reached a point in my life that I wanted to give back and felt that my professional experiences gave me something to contribute,” Cohen said. Cohen’s investment in the college extends to his daughter, a current honors college student. “I did encourage her to consider the honors college because she was torn between the diverse opportunities of larger universities and the small classes of liberal arts colleges. CHC together with UO provide a combination of the two,” he said. Whether he is pulling from his college experience or his success as Vice President of Corporate Strategy at Adobe Systems, Cohen knows the importance of creating a space for collaboration. “It’s important for students to form communities in college, whether that be dorms, clubs, or study groups” he said. “Having a building with a well thought out floor plan provides a space for the honors college to be another one of those communities. To everyone who gave – of their time, knowledge, and many generous gifts. To everyone who fought for a shared vision, and to all those who helped make it a reality. Thank you.